What an inspiring and energizing start to the day on That Business Show with Jamie Meloni. Today is Executive Women’s Day in Tampa, an event that runs in conjunction with 23 different PGA tournaments across the country and with the Valspar Championship on the horizon for this Friday, I had the pleasure of speaking with Carey Lohrenz, the keynote speaker for today’s Executive Women’s Day event in Tampa. Carey Lohrenz is the Navy’s first female F-14 Tomcat Fighter Pilot and professional speaker and author. In her book, Fearless Leadership, she writes about her experience in the Navy and applies these lessons to the business world where she frequently speaks and coaches other professional women on getting past the barriers that block so many in achieving their goals. Carey’s story is awe-inspiring and truly a great story about succeeding against all odds. 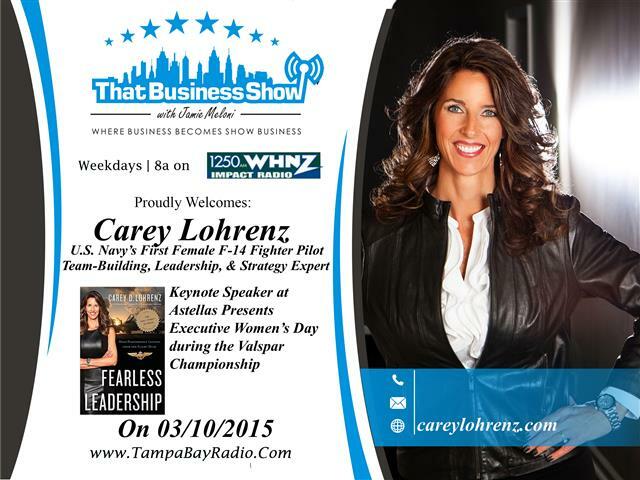 Learn more about Carey at her website http://www.careylohrenz.com or pick up her book Fearless Leadership on Amazon or in book stores nationwide, it is a Wall Street Journal List best seller. 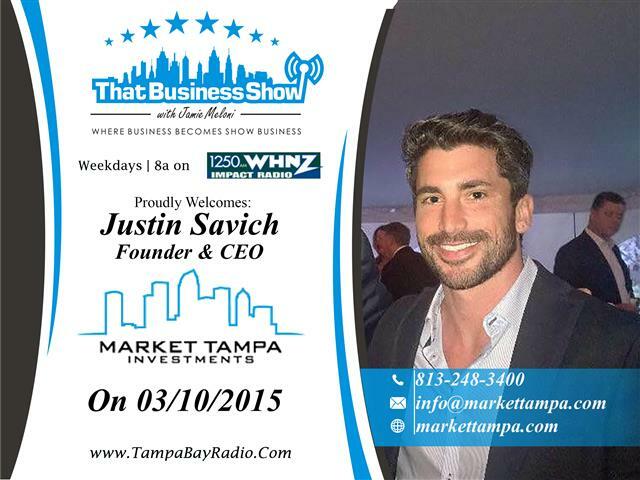 ON the 2nd half of the show, I spoke with Justin Savich of Market Tampa Investments. Justin is an accomplished Real Estate investor and through his company, Market Tampa Investments, he works with investors who want to invest in Real Estate but don’t want to be bothered with the daily operations of the investment. Market Tampa Investments works with both Real Estate and Tech Investments based here in Tampa so all investments are tangible and within reach for the investor to view personally so they know exactly where their money is going. Justin spoke of his successes in Wakeboarding where he achieved a ranking of #20 in the world in this sport and tells a great story about his first Real Estate investment. Learn more about Justin at http://www.markettampa.com or contact him directly at 813-248-3400 or email at info@markettampa.com!